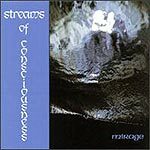 CD review: "Streams of Consciousness"
The best that might be said of this album by the New Age duo Mirage is that it is non-offensive. Then again, non-descript might be a bit closer to the truth. Norman Luboff was never so saccharin. Full of grand, sweeping themes that never quite go anywhere, and simple, repetitive riffs that grate rather than reiterate, "Streams of Consciousness" sounds like a compilation of theme songs from bad romantic movies and TV police dramas that didn't get shown. "Streams of Consciousness" is New Age in style only; it contains none of the sense of vision that sets the best New Age music apart from the Muzak that parades as such.